Dr. Stanley Chepaitis (Advanced violin/viola, Chamber Orchestra, Jazz Studies) holds a Doctor of Musical Arts Degree as well as the coveted Performer's Certificate from the Eastman School of Music. He has studied violin with John Celentano, Renato Bonacini, Carroll Glenn, and Raphael Bronstien. Chepaitis has studied jazz composition and improvisation with John Blake, Bill Dobbins and Rayburn Wright. Chepaitis is also the Music Director of the Chamber Orchestra of the Alleghenies. This group of twelve string players specializes in new, jazz-related works and arrangements, as well as the standard repertoire. He also performs on a regular basis with his own jazz quartet. Wayne Krigger (Cello, Music & Movement) began playing cello at the age of 13 in the Louisville Public Schools. Two years later, he was teaching cello and directing ensembles in a summer program for inner-city youth under the mentorship of Virginia Schneider, a professional musician who introduced the Suzuki method to Louisville. At this time, Ms. Schneider insisted that Wayne begin learning and playing the violin, also. Wayne continued teaching cello in after-school programs throughout high school. Those few years of teaching and playing made it clear to Wayne that this would be his passion in life. When traveling, Wayne observed that many children did not seem to be connected in mind, body, and spirit with their music so he developed a creative movement program. This program engages the body’s large muscle groups and voice while still maintaining the student’s individuality by using music from the early Suzuki repertoire and supplementing with music from other venues and cultures. Wayne is a past member of the Louisville Orchestra. Currently, he performs in the Highland Chamber Players, which is an extremely popular group in the Louisville area. Wayne was one of the original members of the Highland Chamber Players, which was formed in 1982. The HCP plays over 150 weddings yearly as well as many other events. It also provides educational concerts for children in the public schools. Individually, Wayne takes great joy in volunteering at Kennedy Montessori School. Since 1993 he has taught violin to students on a weekly basis at Kennedy. Wayne’s classical cello training was done under the guidance of Guierllmo Helguera, Susannah Onwood, Nella Hunkins and Paul York. His Suzuki cello training was done with Tanya Carey, Nancy Hair, Carol Tarr, Nell Novak, Rick Mooney and Jean Dexter. Wayne and his lovely wife, Karen, have been blessed with two children: Jonathan and Kayla. Marilyn Andersen (Piano, Suzuki Teacher Training) holds the BM degree from Wheaton College and the MM degree from Indiana University. She has taught the Suzuki method for piano in the Wheaton College Community School of the Arts since 1975 and now teaches 15-18 students. She has had many students who have studied with her for 12 to 14 years and some have gone on to conservatory study in their college years. In 1986 Ms. Andersen traveled to Matsumoto, Japan, to study under and observe the teaching of Dr. Haruko Kataoka and Dr. Shinichi Suzuki. Ms. Andersen is a registered teacher trainer of the Suzuki method for piano and has done teaching training at several summer institutes, as well as teaching an ongoing teacher training class throughout the year. Rita Hauck (Piano, Suzuki Teacher Training) has been a Piano teacher since 1959, and a Suzuki Piano teacher since 1974. She and her husband, Dr. Robert Hauck, were privileged to have met Dr. Suzuki in 1966, an event that changed their lives forever. Mrs. Hauck has a Bachelor of Music Degree with a major in performance, a Bachelor of Music Education Degree in both Vocal and Instrumental music K-12, a Master of Music Degree in performance, and two years of Doctoral work in keyboard studies, (Piano, harpsichord, organ , and accompanying). She has been a church organist for 55 years. From 1976-1981, she founded and directed a Suzuki School of 350 students, trained 24 Suzuki teachers, and taught Suzuki piano students at Oklahoma Wesleyan University where she was on the Piano, Organ, and Music Theory faculty. From 1981—2011, Mrs. Hauck maintained a Suzuki Piano Studio of 40+ students in her home in Cincinnati, Ohio where she lived with her husband, Robert. She has been training Suzuki piano teacher in the United States and around the world since 1976. She has been guest clinician at Suzuki workshops and Institutes in 44 states in America, including Alaska and Hawaii, as well as in Canada, Bermuda, New Zealand, and Australia. Mrs. Hauck had the honor of being in vied to be the International Piano Clinician andTrainer of Teachers at the 23009 World Suzuki Convention in Melbourne, Australia. Mrs. Hauck has served on state and local committees for the Suzuki Association of the Americas, the North Texas Suzuki Association, The Texas and Ohio Music Teachers’ Associations, The Music Teachers’ National Association, the Music Educators National Association, The Ft Worth Piano Teacher’s Forum, and National Federation of Music Clubs, and the Fort Worth Music Teachers’ Association. Ms. Hauck’s piano students have won many local, district, regional, and national awards for excellence in performance. She and her husband raised four Suzuki children, all of whom played both piano and strings from age 3 through hight school, and all of whom are adults and still involved in music professionally and semiprofessionally. Mrs. Hauck particularly loves training Suzuki piano teachers all year in a long-term program in her home studio. She loves teaching music to the children and is grateful to have a part in the positive impact upon them and their families. Bridget Jankowski (Collaborative Piano, Andover Educator) is a pianist working in the northeast Ohio area as a church musician, teacher, accompanist and workshop clinician. In 1998 she became the first licensed Andover Educator (with colleague Jeanne Hansen). She has logged over 150 hours of training and study with noted Alexander Technique Teacher and Andover Educators® founder Barbara Conable. She now works with teachers and students on movement and technical issues via the course “What Every Musician Needs to Know About the Body”. She has worked to help injured and uncomfortable musicians overcome their disabilities and technical problems, and incorporates these ideas into her daily work with students, church choirs (children and adult), and cantors. Bridget is currently the Director of Music at St. Matthew Catholic Church in Akron, Ohio and teaches and accompanies with the Western Reserve Suzuki School. Her professional affiliations include the National Association of Pastoral Musicians, the Suzuki Association of the Americas, MTNA (nationally certified), and Ohio MTA. She is an adjudicator for the National Guild of Piano Teachers and other events throughout northeast Ohio. In addition, she has been invited to several other states to give presentations, present workshops or teach at Suzuki Institutes. She has served in the role of music director or accompanist for community theaters and local high school musical productions and has had articles published in the American Suzuki Journal. She currently resides in Cuyahoga Falls, Ohio with her husband and three teenage sons. David Ream (Guitar) – Master of Science, Curriculum and Instruction, National University, La Jolla, CA. 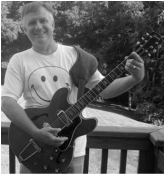 Licensed public school educator in music education since 1990. Suzuki parent. Currently teaches Class Guitar in public middle school. Recently completed the GAMA Teaching Guitar Workshops Level I & II. Formerly led private, individual lessons and has recommended students to the Kids Rock Free® at Fender® Center in Corona, CA. He serves his local church in worship music and regularly attends the I AM festival with his family. Ann Sloan (Handbells, Music Theory, Piano Duets) taught in the Indianapolis Public Schools from 1969 to 1987, serving a wide range of capacities. Her last position with the public school system was in the Shortridge Performing Arts Program where she wrote curriculum for the magnet program and taught music theory, choir, general music, and keyboard. Mrs. Sloan has taught all levels from preschool through college. She has received grants from the Indiana Arts Commission and the National Endowment for the Arts for her work in elementary and middle school general music. She has written curriculum for general music, jazz, keyboard harmony, and music theory. From her teaching experiences, she has developed a music theory method which she uses in her own Suzuki Piano program, and at the Hasten Hebrew Academy, where she has served as music specialist since 1987 and was chosen as Teacher of the Year for the 2008-2009 school year. In 1998 she founded Springwood School, an academically-oriented school for children age 3 through grade 2 with the mission of helping all children reach their highest potential by placing them in an enriched, nurturing setting at a young age. Mrs. Sloan has conducted workshops for the Indianapolis Montessori Schools, Marian College, the Indianapolis Public Schools, and for Suzuki programs in other cities. Her successful teaching methods have made her the subject of local articles and earned her a listing in Who's Who in the Midwest. Maggie Davis (Fiddling) graduated with a BA in violin from Butler in 2001. Since then she has been teaching private violin, voice, and viola lessons to students of all ages. She attended Mark O’Connor’s fiddle camp in 2005 and has since been active playing Celtic fiddle and alternative folk styles. She’s played fiddle and lead vocals in the traditional Irish band Ennis Clare, and with the folk band, Iron Curtain Breakdown. Currently she performs with the touring Celtic rock band, Mother Grove. MaryEllen Fellegy (Visual Arts) has been the Visual Arts Specialist at the Hasten Hebrew Academy since 1998. Prior to joining the staff at Hasten, Mrs. Fellegy taught at St. Thomas Aquinas School in Indianapolis for two years. Her greatest abilities lie in developing creativity in children through artistic expression. She has experience working and teaching a variety of art media including painting, drawing, ceramics, and mosaics. She often works with local artists to assist in their artwork or to further enhance her own art skills. Each year Mrs. Fellegy enters student creations in the Indianapolis Symphony Orchestra “Symphony in Color Contest,” and virtually every year artwork done by her students is selected for awards. In 2005, Mrs. Fellegy was selected as Teacher of the Year for the Hasten Hebrew Academy due to her commitment to excellence and her ability to integrate her art programs into the curriculum of Jewish Studies, Language Arts, Math and Science. Mrs. Fellegy has been a long-time supporter of the arts through the Counterpoints of North Central High School, the Indianapolis Museum of Art, the Indianapolis Symphony Orchestra, and the Indianapolis Symphonic Choir. Audra Gipson (Family Chorus, Voice, Gymnastics) is the head of the music department at Christel House Academy in Indianapolis. A graduate of Butler University, her principal instruments are voice and flute. Audra was a member of the internationally-known Indianapolis Children’s Choir (ICC) for ten years, and was a featured soloist on two ICC-produced albums . With the choir she traveled to seven countries and was a soloist on both voice and flute in venues around the world, including a soprano solo with the Moscow Chamber Orchestra. Audra has served as a performer, director, and makeup/costume designer in various musical theatre productions. Audra - a competitive gymnast for five years - taught gymnastics for eight years at a local private school. Initially gymnastics was added to the curriculum to aid students in academic development and understanding of spatial awareness; however a high percentage of Audra's students have become excellent gymnasts. Audra's professional affiliations include Kappa Kappa Psi, honorary band fraternity, and NAfME: The National Association for Music Education. David Cross (Martial Arts, Teen Program) has been training in various martial arts since age 5 including: Jeet Kune Do, Kali, Wing Chun Kung Fu, Tae Kwon Do, Jujitsu, Taijichuan, Xingyiquan, fencing, and wrestling since 5 years old. He earned his instructor certifications in Paul Vunak’s Progressive Fighting Systems and Mike Vanbeek’s Focus Jeet Kune Do. Scott in his Suzuki institute days! Scott M. Kolman-Keen (Festival Administrator) is the founding director of the district-wide orchestra program in the White Bear Lake Area School District in suburban St. Paul, Minnesota. He has a natural passion and intensity that captivates students of all ages and abilities, and he has had demonstrable success in all levels and disciplines of education. Scott is guided by an unyielding love and respect for children, as well as his deep-rooted belief that all children are capable of becoming sensitive, intelligent, and successful human beings. His professional affiliations include MENC, the national PTO, OAKE, AOSA, NEA, and AFT. He is a member of Kappa Kappa Psi and Phi Mu Alpha Sinfonia.